Iv'e read older posts about this ship kit but have several questions that weren't covered. I started mine several years ago, lower masts are in place, and just beginning rigging. Got spritmast rigged and just starting on foremast. Maybe I can help, ask away. Can't answer either question. I left the sides as is. This brings up an issue. Even with the sides as they are, I remember it being a bit of a struggle to get the decks in place, after hull glued together. Had to apply quite a bit of force, and worried I'd seperate the hull halves, but it worked out fine, there was enough give. Sometimes, the effect is as important as the actual detail. If you have say a four decker, and the plastic scales at 6" at the bulwarks, it follows that if each deck below that has thicker sides, it will look much more "real" that a consistent plastic shell. If you add progressively thicker frames around the ports from the first gun deck below the weather deck, down. Using a "chopper", basswood and CA, it's the work of an evening. As for fitting the decks, just keep out of their way. Had no trouble inserting the lower masts. In fact, I did not even glue them in place- I figure the shrouds will hold them in place. The only upper mast I have done yet is the sprit topmast. I will only put the upper masts on the rest after I have rigged shrouds, ratlines and stays. And yes, I bought aftermarket blocks. I'm pretty sure I didn't glue mine in either . the mast's do go through 4 deck layer's , pretty much no room for them to go anywhere . I also did as GM said and each deck layer the extra styrene got smaller , around the gun port's . very happy with the effect . Thanks for all the info guys,it's really interesting to see how everybody builds. Im thinking of getting after market blocks,there are some really nice ones out there. I would really like to tell everyone that a wonderful gentleman named Jeff emailed me the English instructions to the Le Soleil. Thanks Jeff! They are clear as a bell. I must say that the rigging on this ship scares the hell out of me! It seems a daunting task!I guess start at the front and work towards the back?Any ideas on this? When you hit the reply button, you see the message you are replying to, with a big buttom below that says "Add Quote to your Post." Click that. Here is the tricky part. You must now scroll down to the part that says (in brackets) (slash) quote. You must put the cursor now below that phrase. Then type your reply. So here's another great question.Has anyone used or made those parells(I know I spelled that wrong) to hold up the yard arms? If not what do you use to hold them on that looks ship like? Also since that rig is no good to make rat lines( I've tried it and its really hard to get it to work right) what do you guys think is the best way to make them?Thanks for your help! Thanks Steve for the link! it will be a great help! Looks like you've gotten some solid advice to your questions. Parrel kits for my build were from http://www.agesofsail.com/ I think they were Amati brand, so I'm sure they're available elswhere...but really good little parrel sets. I had some good info on my WIP thread of this kit, but it's a shame the pics have been un-hosted by photobucket...kinda takes a lot of the value out of that thread. Thanks guys, you have no idea how much this means to me.Its great to talk to someone who is or has gone through these builds and has eliminated or at least figured out problems with these kits.It helps us as to be ,or in the process of, building these great ships. Something that absolutely fascinates me is the actual task of building the real ship! Being a carpenter for these past 45 years makes me appreciate what went in to putting this whole thing together. It took several acres of choice timber that had to be cut down by hand and shipped to the shipyard where it took approx 300 men about two years to build these magnificent ships.So with every plank and every block and rope(thread) we put this ship together (for the most part) in a same way /fashion as they did.Its such a joy to stand back and look at it when your done just as they did.Oh what fun! 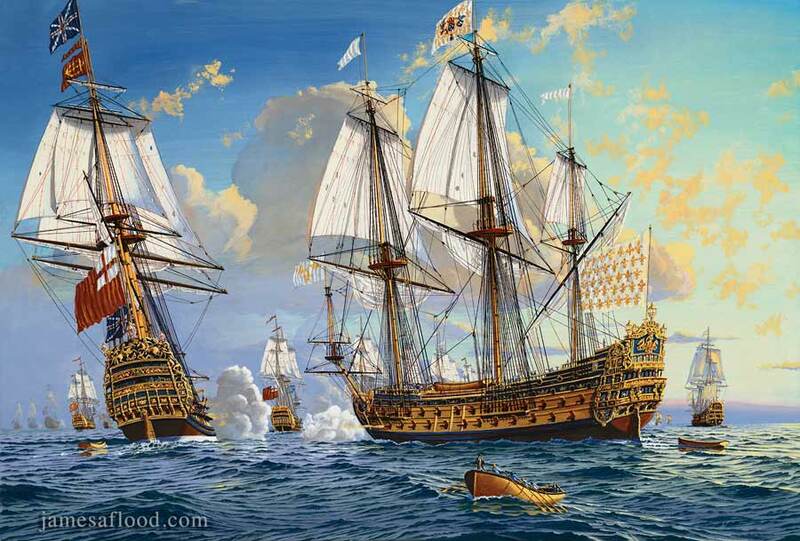 The SOLEIL ROYAL and the English BRITANNIA exchanging gunfire during the battle of Balfleur in 1692. The SOLIEL ROYAL was grounded and burned by an English boarding party. Painting by James A. Flood. Please, more model building photos of this intertesting sailing ship. Radek at HiSModel is great! Check his store out for anything you need for sailing ships. Also, his customer service is fantastic! Just got the flags from HiSModel and they look great! The cloth sails,parrels,and rigging string is on the way.Has anyone had experience with these or other cloth sails? The box instructions tell you to glue a string around the entire perimeter of the plastic sails with "loops" in the corners to tie them off,I understand that these cloth sails already have these loops"built in". I would love to hear feed back on your experiences with both of these scenarios. Hey Dave, I saw your WIP on the SR.It was fantastic. What's the deal with Photobucket? How do you get pictures on here? I just started mine and want to share! you have to pay on photobucket now , so they just stole everyone's photo's , pay or we keep , nice guy's . try postimage it's free mate . If you can get your images posted from Flickr I'm sure you'll have no trouble figuring out how Postimage works. They're both similar. P.S. I used the hot link icon above but it doesn't seem to be working just now. Simply copy the address above and paste it into your browser. How do you do postimage? There is another forum that is better for help questions. It is the Forum Technical Assistance forum, down below in the Feedback, Help, and Testing section. Because of the turmoil when Photobucket changed their policies, using other hosting sites, you may find your answers already in a thread there, or if you ask, there are people who hang there who are really good on answering that kind of questions. Thanks Don! After reading this help section it appears that no pictures can be uploaded to this site! What a bummer! Am I reading this wrong? One of the best parts about this forum is not only to exchange ideas but to see each other's work and how they do things. GMorrison and I both use Fotki. Try it for free and then you have multiple inexpensive yearly or multi year plans. If you need help with it shoot me a PM. Thanks, LIVIT for starting the answer. Jim, this is easier to explain once you get a photo on a share site like Fotki. It needs to be a .jpg. If you can go ahead and set that up, we'll take it from there.